The Indiana government has me on their web site! NO, NOT ON A WANTED POSTER! I also got an email from Jo Ann Spieth-Saylor, editor of The Corydon Democrat, that the email interview she did with me is in the paper this week (it’s a weekly). Alas, it is not online. 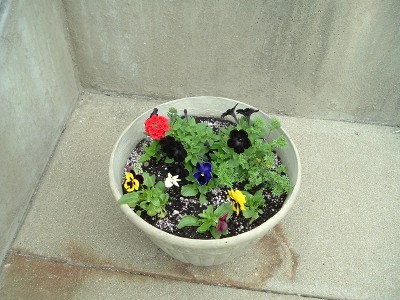 Also, because everything is not all about me, here is a beautiful picture of a little planter outside Mom’s eye-doctor’s office. A WRITING PROMPT FOR YOU: Take that planter of flowers for your inspiration. This entry was posted in Grab bag. Tagged BSP. Congratulations Marian! You truly deserve it.